Want to add your survey to a website/mobile app? Smart idea! Depending on your site and project purpose, choose from a few options to make the connection. Maybe it’s a short-term link for a quick project, or maybe it’s a form that should be embedded on your site for ongoing access – pick your choice, then start expanding your audience! Creating a survey link on the website is a common and versatile way to collect responses. Publish the survey link on your website or blog, include it in a newsletter, or send via email. Select your survey, then click on the Publish icon. Under Publish on Website, select Link and click on Continue. To generate a new link, choose Create New URL, then click Continue. First, enter a description of the URL and click on Generate URL. A description is especially important if you have multiple URLs posted in different places. A clear description will allow you to differentiate between the two published links. On clicking Continue, you will see the link and options to Copy or Customize Link. Clicking Customize Link will allow you to modify the key of the URL. To use a link already created for this survey, choose Use Previously Generated URL and Continue. Embedding a survey or form on your website/mobile app allows you to collect responses from website visitors without interrupting their browsing experience or sending them away from your site. Embed Survey on a Website allows you to integrate a survey into a Web page. Proceed by clicking on Continue. Display Setting lets you control the height and width for your embedded survey and based on the design and target resolution of your web page. You can further customize your survey by setting the border color or show partial survey within your webpage. You can open an embedded survey in a new tab by enabling Show partial survey within your webpage. You may also refer to the recommended height and width settings mentioned in the help and use these values. Proceed by clicking on Generate code. Copy/Paste the embed code to your webpage. On clicking Preview Survey, you can preview your survey with selected dimensions. If you wish to make changes to the height and width for your embedded survey, you may use the Back button to go to previous step and customize the values. Click on Done once you have copy/pasted the embed code to complete publishing. Embed Survey as a Pop-up in a Webpage allows you to integrate the survey as a pop up on your webpage. A pop-up window will be displayed as soon as the webpage has loaded. Display Setting lets you control the message to be displayed in a pop-up, height and width for your Survey Pop-up, and the frequency of the pop-up window. The Display Survey Pop-up Every X visitors option, for example, allows you to enter the number 3 if you wish to display the pop-up to every 3rd visitor. Copy/Paste the code into your webpage. On clicking Preview Survey, you can preview your survey on a sample web page. If you wish to make changes to the height and width of the pop-up window, you may use the Back button to go to previous step and customize these values. 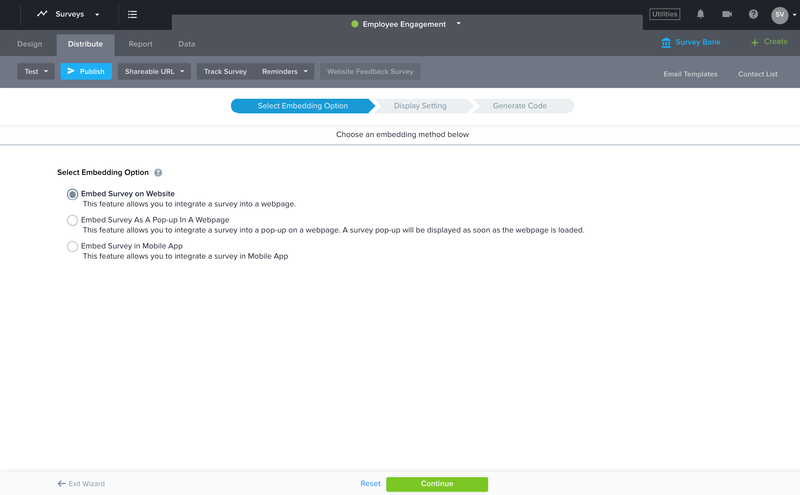 Embed survey on a mobile app allows you to integrate survey in your app. Copy the embed code provided and use it to display it in the webview of your app. Depending on your project, you might want to offer visitors the chance to send themselves an invitation so they can participate later. Simple enough! Next, enter the message to be displayed in Survey Invitation Pop-up. Invitation pop-up Height and Width. Survey pop-up Height and Width. The frequency of pop-up using the option Display Survey Pop-up Every X visitors. Pop-up Button Setting to modify the text of buttons that are displayed in Invitation pop-up. Copy/Paste the code into a webpage. On clicking Preview Survey, you can preview the invitation pop-up on sample webpage. If you wish to make changes, you can use the Back button to make required customization. Copy/Paste the code to your webpage and click on Done to complete publishing wizard. When you want to know what visitors think about your website, Website Feedback Survey will help you gather insights and find ways to improve each visitor’s experience. Select Website Feedback Survey from the menu of options. Confirm that your survey is ready to be published. Make any final changes before moving on. Once all required changes are made, click on Generate Embed Code. Copy/Paste the code to your webpage. Any survey can be used as a Website Feedback Survey, provided its status is Edit and it does not have questions marked for pre-population.